I’ve found it puzzling that there’s all this talk about the prospects for the dollar, in the wake of the G-20 meetings, and more recently World Bank President Zoellick’s comments about the primacy of the dollar as a reserve currency. My puzzlement arises from the fact that many of the concerns now being voiced have been voiced before. “There is every reason to believe that the euro’s acceptability could grow,” Zoellick said in a speech today in Washington. “Of course, the U.S. dollar is and will remain a major currency. But the greenbackâ€™s fortunes will depend heavily on U.S. choices” on inflation, the budget deficit and financial oversight, he said. The World Bank chief outlined ways he sees the balance of power in the global economy shifting after the financial crisis. China and probably India will rise in influence and the U.S.’s economic might may be diminished as the international system is “overhauled before our eyes,” he said. In excerpts of his speech released yesterday, Zoellick said, “there will increasingly be other options to the dollar,” and the U.S. shouldn’t “take for granted” its standing. While didn’t specifically mention the yen in the full text of the speech, he said Japan’s “old export model” of growth may not be sustainable in a world that’s less reliant on U.S. consumers. So, if one looks at the breathless commentary about the euro’s share rising to new highs, well, that’s true, insofar as one looks at known euro reserves and known allocations. 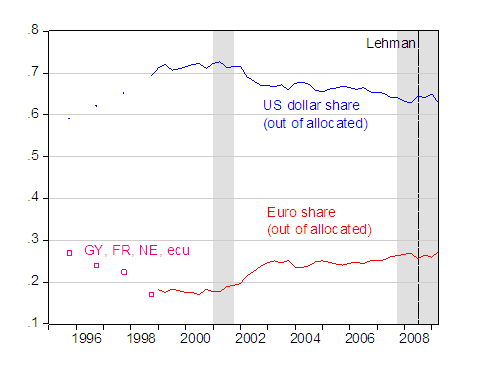 Figure 1: US dollar share of allocated reserves (blue), euro share of allocated reserves (red), and share of allocated reserves accounted by sum of Deutsche mark, French franc, Dutch guilder, ecu (pink squares). NBER defined recession dates shaded gray; assumes latest recession ends 2009Q2. Source: IMF, COFER, September 30, 2009, NBER and author’s calculations. The picture looks a lot less clear when one tries to think about total reserves, a large share of which is of unknown (well, unreported) composition. As always, a little perspective is helpful. Figure 2 shows a longer sample (using different data), and the US dollar share normalized by total reserves, rather than allocated reserves. Figure 2: Log nominal value of US dollar against major currencies (blue, left scale), US dollar share out of total reserves (red, right scale), US dollar plus 60% of unallocated reserves (green, right scale). US dollar index for September through 9/22. Source: IMF, COFER, September 30, 2009, Federal Reserve via FREDII, and author’s calculations. 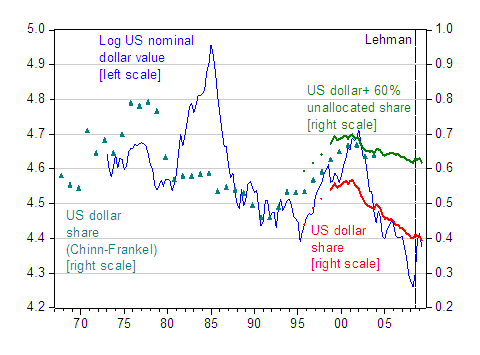 Notice that the estimated dollar share was relatively low, during the mid-1980s, despite the extremely high trade weighted value of the dollar. Further observe that while the reported US dollar share is now at a record low level (a few percentage points below what it was at the end of 1995), this is the known share. The unallocated share is quite large, and making an educated guess that 60% of unallocated reserves are in dollars yields a somewhat different perspective (the 60% figure makes the end-2003 old series match the guesstimated series). Then the dollar share has been lower, particularly in the early 1990’s. In other words, in terms of analysis, the speech was much ado about nothing, although I may be missing some sort of political subtext (i.e., ). What about all the talk about the dollar decline and rebalancing? It was clear before the G-20 meetings that, regardless of what was said and agreed to, dollar adjustment would occur. The extent to which adjustment would occur was, admittedly, obscure before. But it still remains so, exactly because the trajectories of consumption and potential GDP in the US, Europe, and East Asia remain uncertain. 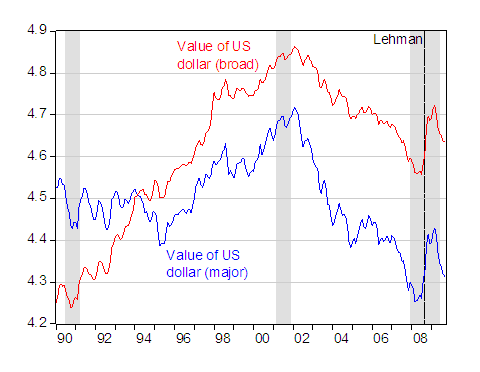 Figure 3: Log nominal value of US dollar against major currencies (blue), log nominal value of US dollar against broad currencies (red). US dollar index values for September through 9/22. Source: Federal Reserve via FREDII, NBER, and author’s calculations. Portfolio balance effects (dollar asset supply versus demand). Cyclical factors (demand for credit, relative price movements, interest rates). Structural factors (composition of demand, trend output). This is not an exhaustive list , but it highlights the variety of the relevant effects that have different influences at different horizons (I’ve skipped purchasing power parity, pure monetary models, etc.). Let me talk about each of these factors in turn. Portfolio Balance. In this approach, one focuses on stocks of assets denominated in different currencies. In the standard (mean-variance/CAPM) approach, demand for assets depends upon the covariance of relative returns with dollar returns, and the coefficient of relative risk aversion. See this post for the technical exposition. Increasing amounts of US government debt should, holding all else constant, result in a higher risk premium on dollar assets, or a weaker dollar, or both . Of course, during the next few years, governments around the world will be issuing a lot of debt as well. Rising default risk relative to other countries could also be put into the model; if the perceived default risk were to rise (once again relative to other countries’ government debt), then the risk premium would again rise. But there was nothing at the G-20 meetings to infer a greater incipient increase in US debt than was previously forecast. Cyclical Factors. Where the economy is in terms of the business cycle has an also impact on the exchange rate. For instance, the US was entering into recession before the euro area; and as shown in Figure 3 the dollar was declining before collapse of Lehman spurred the flight to safety in September 2008. In part, this correlation is due to the empirical strength of Taylor rule fundamentals (see , ). Now that we’re at the zero interest bound in the US, that effect may be in abeyance. Nonetheless, if the US recovers before Europe (and Japan), then the relative price of US goods will rise, pushing up the dollar. So, I’m a bit mystified by the short term pessimism about the dollar’s value (over the longer term, other concerns will dominate). 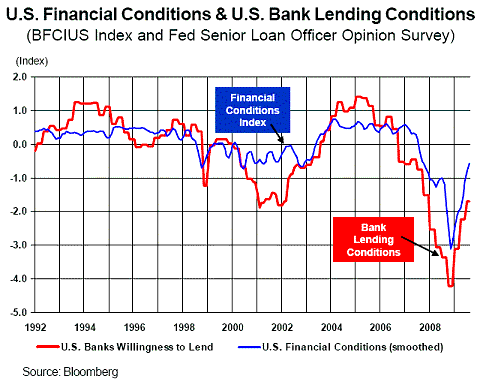 Figure 6: from Michael Rosenberg, Financial Conditions Watch (Bloomberg, September 11, 2009). Structural Factors. One of the main points emanating from the G-20 meetings (communiqué) was the need for rebalancing . In my previous post I observed that given the considerable evidence in favor of US consumer retrenchment, rebalancing would be more likely than in the past. However, one of the big questions involve what happens in China and East Asia. I am somewhat skeptical about China experiencing a consumption boom, and sustainable growth in government spending and investment; but Nick Lardy has a more optimistic outlook on these counts . To the extent his more optimistic view turns out to be more accurate, then the adjustment that has to be effected by exchange rate changes will be smaller. That being said, lower trend consumption growth is also consistent with a weaker dollar, holding all else constant. Once again, I don’t see how the G-20 meetings would have induced a revision in views regarding the paths of consumption in the US and China. How Much Further Can the Euro Fall?